The new polymer £10 note, featuring Jane Austen entered circulation on 14 September 2017. She was an English novelist known primarily for her six major novels, which interpret, critique and comment upon the British landed gentry at the end of the 18th century. 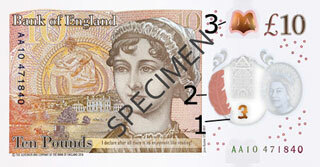 There is a large see-through window on the note. A clearly defined portrait of the Queen is printed on the window, with the words ‘£10 Bank of England’ twice around the edge. Winchester Cathedral There is a finely detailed metallic image of Winchester Cathedral, where Jane Austen is buried, over the see-through window. The foil is gold on the front of the note and silver on the back. When you tilt the note, you will see a multi-coloured rainbow effect. 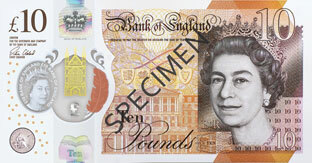 The foil £ symbol in the window is silver on the front of the note and copper on the back. At the side of the see-through window is a coloured quill, which changes from purple to orange when you tilt the note. You can see this effect on both the front and back of the note. On the front of the note, below the see-through window, is a silver foil patch. 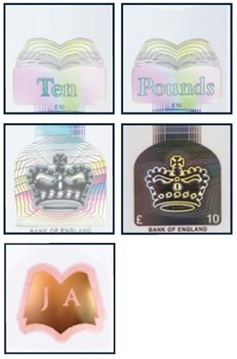 When you tilt the note the word ‘Ten’ changes to ‘Pounds’, and you will see a multi-coloured rainbow effect. On the back of the note, a book-shaped copper foil patch contains the letters ‘JA’. 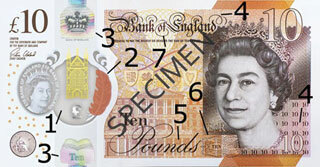 The £10 note is printed on polymer – a thin and flexible plastic. 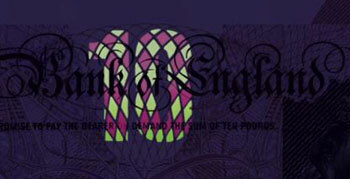 The words ‘Bank of England’ are printed in raised ink on the front of the note, there is also raised print in the bottom right corner, around the number 10. If you look at the front of the note under a good-quality ultraviolet light, the number 10 appears in bright red and green, while the background stays dull in contrast.